We should start early for seeing something of Salisbury at daylight and going to Stonehenge, close to there. Visit to Stonehenge should be short and, after covering the 110 Km to Oxford in around one hour and a half, we would explore that city following an itinerary through the center and lunching there. After that, we would drive to Croydon for another one hour and a half ride to leave the baggage at our hotel. 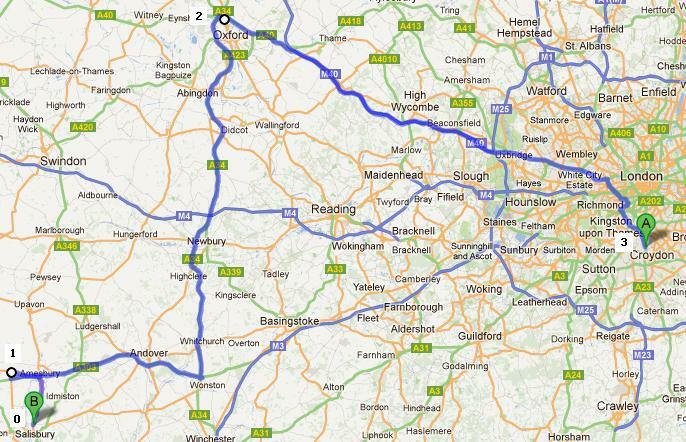 Then I would go to deliver the car, not far from there, to be ready for spending the next days to London city. We manage quite well our mission of getting ready for leaving early. After a great breakfast and check out, we’re in the car a few minutes past nine. I’m afraid of the car, but I believe it can be better with my orientation mess at daylight. A believing which breaks so soon because, although we can see the Cathedral’s spire from almost everywhere we find ourselves out of the city. We come back to Salisbury and end getting into the first parking I see in the city center because, although I wanted to park close to the Cathedral, I think we’re going to save a lot of time by walking around. We’ve wasted more than 30 minutes with this. It’s going to be a long day! We get the street in a sort of shopping mall. There are modern shops in a classic environment. We take the street to go directly to the Cathedral helped by a map I’ve got at hotel. We pass by ancient walls and under stone arches between houses with old architecture. All of these houses are showing proudly its colorful coat of arms. When these disappear and a vast area of grass is at both of our sides instead we can feel the Cathedral is near. Soon, the tall spire we could see above the roofs shows its magnificent base. This Cathedral is huge and it’s different to the gothic ones we’ve seen before. It’s a pity one of its sides is in improvements works and covered by a scaffold, because we would want to see all of it. We walk all around it and got amazed by its West façade, looking as a big and beautiful display of stone statues. It’s really impressive. We then go inside. As it is huge it’s full of halls. We enjoy our pictures on its big cloister, with the green courtyard in the middle. It’s spectacular and we would wish having enough time as per exploring it deeply. When coming back from our tour we comment the feeling we already had yesterday about Salisbury: it deserves to be visited by itself, regardless Stonehenge is close or not. We still walk around the city before taking the car, exploring Market Square area, which is looking different than yesterday, when it was dark and the market filling all the space. It’s going to be 12 PM, so we must leave. At this point, it’s not a surprise I get lost for leaving Salisbury, at least, for leaving it by the right road, and we reach Stonehenge 45 minutes later for a way should be less than 30 minutes. We’re assuming it is like this and this island without a GPS is genocide of time. At least, in our way by the wrong road we could see Old Sarum ruins from the car, an archaeological site of an ancient city of which we could see a model in the Cathedral about how it looked like. I think I’ve got quite clear the way we must follow to Oxford so let’s enjoy Stonehenge. The parking area is at one side of the road and the ruins are in the other side, although the entrance is in the parking side. After paying 6.60£ for the tickets we must choose the language for the audio guide and pass through a tunnel under the road to reach Stonehenge. The much known picture is now in front of us, in live. I’m in a Windows background! You can be there as much as you want, but this is a short visit as there is nothing else to do here but following the loop path around the monument which returns to the entrance, which is also the exit. The path gets closer and further from the stones on its different points and Stonehenge can look really different around its 365º view. The stones are bigger than I expected and the structure has something special. One could think it’s not more than a pile of stones set in circle, but the size of them, the look, with the lichens giving them a history certification, and, above all, the environment, composed by a vast flat green land, without a single rock in the whole area until the horizon, give this magical aura this place has got. I take the road very concentrated in order of avoiding more mistakes and, therefore, wasting more time. It’s 12:20 PM and it means the daylight time we’re going to have in Oxford is quite short now. Less would be almost the same than not going. I’ve done it right when we reach Oxford, just before 2 PM. I’d came here with the idea of driving to the center and looking where to leave the car once there, but in Oxford outskirts we already meet the signs to the park&ride, we use it. It is a system of cheap parking far from the city center, when we’re taken by regular buses. 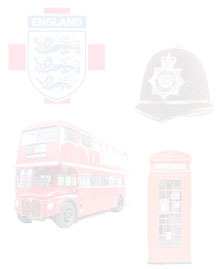 Due to the experience driving by English cities I think we’re going to save some time. Once out of the car we use the toilets and provide with maps and vouchers about Oxford while waiting the bus to come. These buses are green and double decked and they leave us in the center by 2:30 PM. Rate is 2£ for the round trip. Now we’re in the streets of the city center we’ve got a problem: it’s lunch time but there are less than 2 hours of daylight for today so, if we spend them in the meal, we’re already done with Oxford. But my wife sees a KFC and says she would like to eat in there and that’s really a solution as lunching in KFC is really fast. These streets are full of young people and we’re crazy about exploring this place, so we’re out again and eaten in 30 minutes. It’s 3 PM and we’re to start the itinerary I’ve got prepared for this beautiful city. This itinerary starts in Carfax Tower, where we can see its old clock (below at left), and follows High Street until taking Cattle St, at left, passing between All Souls College and Radcliffe Square, with its remarkable camera. We must say, apart from the marked spots, all the buildings around has a spectacular architecture with some centuries on them. We turn at right and find the Bridge of Sights which, as already happened with Salisbury Cathedral, is in improvement works in one of its sides. We walk through the lonely and beautiful streets intuitively for a while until being back in High St., close to Magdalen College and its remarkable square and six-picked tower. We’re shocked by the amount of bicycles in the street. We reach a Botanical garden across the street and we can see, at the bottom, uniformed children playing rugby in a big pitch. Somehow, I’ve got a clear plan at this point and, after checking the way in the map, we follow Merton St. to reach the entrance to Christ Church College. But we cannot go in, at least from here. A guard points to a sign showing how to go to the visitors’ entrance. We’re at Canterbury Gate and must go to Meadow Gate, just in the opposite side. We walk all that way, which goes along the rugby field we saw before, which seems to belong to the Christ Church, and the entire children pass over us running to the building as the match seems to be over. We follow them at our speed to walk in by the same dor, where there is a ticket box with a good discount for seniors which my parents can take advantage of. It’s 6£ for us and 4.50£ for them. We explore the halls and gardens inside where we pose with a beautiful Christmas tree. An uniformed caretaker is kind enough as per taking a picture of the group in the big courtyard and then we go upstairs to visit the place really made me come here: the hall which the Hogwart’s Great Hall is inspired of. But as the real Hogwarts doesn’t exist we see this one, which is a main visit in the Harry Potter tour performed in this country. The hall is carefully set as the big Christmas’ eve dinner would be this night. The walls are full of paintings showing old portraits, and there are a lot of them, because as the ceiling is so high, there is a lot of wall to fill. . This hall is in Look-but-don’t-touch mode, although you can go deeper inside, between the tables for a closer look. You can feel indeed the smell of Hogwarts here. With this we’re done of our highlights in Oxford. Now it’s time to return to the car and driving to our hotel, then I would drive alone to delivering the car. I’m feeling panic about that last part. Step by step. It’s already dark and we walk until seeing the Oxford castle looking for a bus stop I saw from the bus itself when coming, but as we cannot find it, we walk to the stop we were delivered at and, when this green bus arrives, we get into it. It’s 4:30 PM and the car can be delivered until 9 PM. We will manage it in either way. We feel the bus ride quite long and we go outside, although it is a big parking space I can feel something is wrong. It’s like while we were out small changes were made here. I share this feeling with the driver and he immediately brings an answer. He asks me for my parking ticket and says: “See?, this is for Redbridge and we’re in Pear tree”. Damn, we’ve taken the wrong bus! Well, not exactly, as this has the same number on display than the one we came with, but we’ve taken the one going to the opposite direction we want. It has sense: if we go to the same bus stop we were delivered and go up to the bus following the same way, we will go on until the end of the route, not backwards. In this case, we parked in the area in Southern Oxford and now we are in the Northern area – and even furthest-. Solution is clear: we must seat in this same bus as it goes back to Oxford city center and then goes on to the Southern par&ride. So finally, we’ve wasted a couple of hours with this silliness from my part just for making things interesting. We get the car pretty tired with still a long ride in front and still we get into a traffic jam for leaving Oxford. 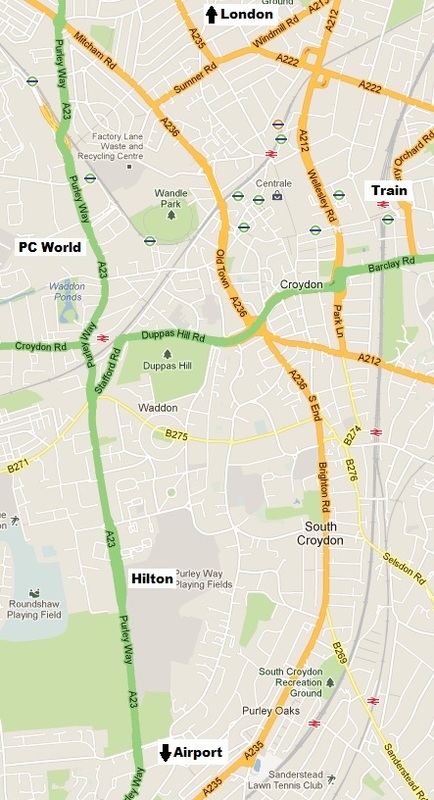 Once in M40 we reach Croydon with no more issues. Finally!. It’s around 8 PM and I’m crazy for leaving the car forever. Somehow, after some minutes in Croydon I know the nightmare is not over. I’ve followed the broad avenue expecting to find some reference point in the map from the hotel area I’ve brought, but I haven’t found any so, again, I’m completely lost. We ask, a lot, to reach Purley Way, the avenue where the hotel is located, which I’ve got entirely printed here from Google Maps. We’re very happy because this was getting harder. But, incomprehensibly, nightmare is still on. I’m driving along the avenue but cannot find the hotel. Not even the airport it has in front! When we reach the PCWorld I understand we’ve passed the hotel over and turn around, but nothing. I cannot understand what is happening. I’m in the right street, I’ve got some references but I’m not capable of finding the place. I want to cry. Finally stop in a petrol station and share all these thoughts to the man at desk desperately. And then, one of those magical moments happens: that man gives me all the light I need without even saying a word, he just take my map, turn it around and give it back to me. Everything is explained now. So I was driving Purley Way in the upper side of the map, and when I finally drive beyond PC World everything appears: the airport, the hotel, the shopping mall... I’ve got tear of happiness. I still don’t understand how we’ve ended at North coming from the South but we’ve been driving a lot of time around this city and everything is possible. Hotel Hilton has free parking and it is very welcome as the car is going to sleep there. It’s some minutes to 10 PM and we only want to take a quick dinner and rest. The rooms are nice and it seems we’ve got a good choice here. Before going downstairs for some sandwiches I call to the rental company and they tell me if I deliver the car early tomorrow there is no extra charge. I promise going first time in the morning and ask about all the details I could need for reaching the place. The plan for tomorrow is I’ll leave very early, around 6 AM, and they can go downstairs for taking their breakfast. I’ll appear sooner or later. But now I only have one picture in my mind and it is precisely the one at right.